8/7/10: Over 1000 attendees converged in Springfield VT at the 75th Stellafane Convention last weekend. 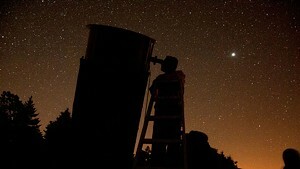 Amateur astronomers and telescope makers spent 3 evenings gazing at the Vermont sky. Sort of like Woodstock for the stargazing crowd. Music: The Cush, An Appreciation for Sunshine, "Distance"